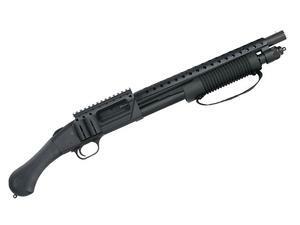 Mossberg 590 Shockwave SPX 12GA 14"
Featured Products > Mossberg 590 Shockwave SPX 12GA 14"
*Not available for California and Restricted States. The 590 Shockwave SPX features a heat-shield, breacher muzzle and side saddle/top rail. The Shockwave Raptor bird’s head pistol grip is uniquely shaped to minimize felt recoil. Includes all the features that have made Mossberg pump-actions the choice for millions worldwide: ambidextrous safety, dual extractors, positive steel-to-steel lockup, twin action bars, and a smooth operating anti-jam elevator. The Bureau of Alcohol, Tobacco, Firearms & Explosives has confirmed the 590 Shockwave as a “firearm” per the Gun Control Act (GCA), but not a Class 3/NFA firearm.